To be a successful candidate for engineering jobs, resume expert Kim Isaacs says it helps to have a comprehensive resume. 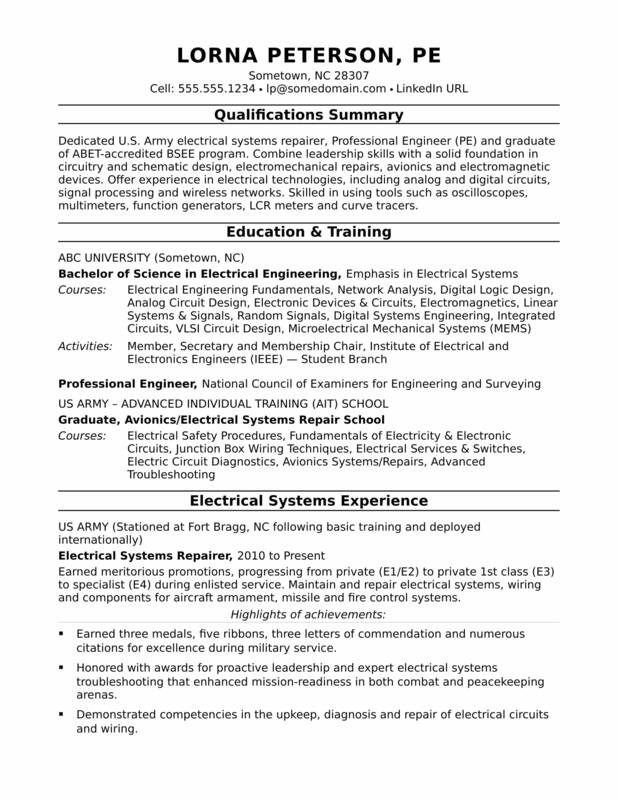 If your resume is giving off the wrong signal, view this sample resume for a midlevel electrical engineer that Isaacs created below, and download the midlevel electrical engineer resume template in Word. And if you need more help, get a free resume evaluation from the experts at Monster's Resume Writing Service. Jobs for electrical engineers are projected to grow by 7% (or 21,300 jobs) from 2016 through 2026, According to the Bureau of Labor Statistics (BLS). You’ll find the highest level of employment for this job in the following states: California, Texas, New York, Michigan, and Massachusetts; and in the following metropolitan areas: New York City, Los Angeles, San Jose, California; Boston, and Dallas. As an electrical engineer, you can expect to make a median wage of $97,970 per year, or $47.10 per hour, according to the BLS. Additionally, you can search for electrical engineer jobs on Monster. Dedicated U.S. Army electrical systems repairer, Professional Engineer (PE) and graduate of ABET-accredited BSEE program. Combine leadership skills with a solid foundation in circuitry and schematic design, electromechanical repairs, avionics and electromagnetic devices. Offer experience in electrical technologies, including analog and digital circuits, signal processing and wireless networks. Skilled in using tools such as oscilloscopes, multimeters, function generators, LCR meters and curve tracers. Earned meritorious promotions, progressing from private (E1/E2) to private 1st class (E3) to specialist (E4) during enlisted service. Maintain and repair electrical systems, wiring and components for aircraft armament, missile and fire control systems. Earned three medals, five ribbons, three letters of commendation and numerous citations for excellence during military service. Honored with awards for proactive leadership and expert electrical systems troubleshooting that enhanced mission-readiness in both combat and peacekeeping arenas. Demonstrated competencies in the upkeep, diagnosis and repair of electrical circuits and wiring. Isolated faults and resolved electrical system malfunctions of varying degrees of complexity. Gained thorough knowledge of power and distribution systems, circuit calculations, hydraulic and pneumatic systems, process control and instrumentation. Check out an entry-level electrical engineer resume sample for additional resume format tips.